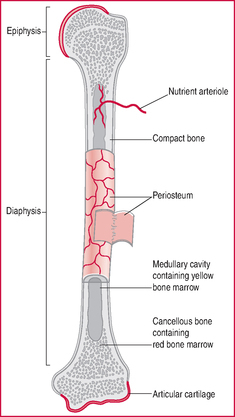 Structure of a typical long bone. is measured as an indicator of bone mass, decreased in osteoporosis. Men and women who participate in strength and power activities have a bone mass as great as, or greater than, that of endurance athletes. On the other hand, the amenorrhoea that is prevalent among female athletes in weight-related sports is associated with a decrease in bone mass, leaving them at increased risk of osteoporosis and stress fractures despite competitive athletic participation. See also dual emission X-ray absorptiometry (DEXA), female athlete triad.